WEAST: .You are an award winning architect from Sarajevo who lives in Germany. Can you say something about your career? Alen Jasarevic: My parents came to Germany from the former Yugoslavia in the 1970s. I grew up in Bavaria, and went here to school and I see myself more as bavarian with bosnian roots. After graduating from high school, I studied architecture in Augsburg and then gained first experience in a renowned architectural office. After this intensive apprenticeship, I became self-employed in 2003. Today, I work with 10 employees on various projects for housing construction, special buildings, school buildings, sports facilities and urban studies. 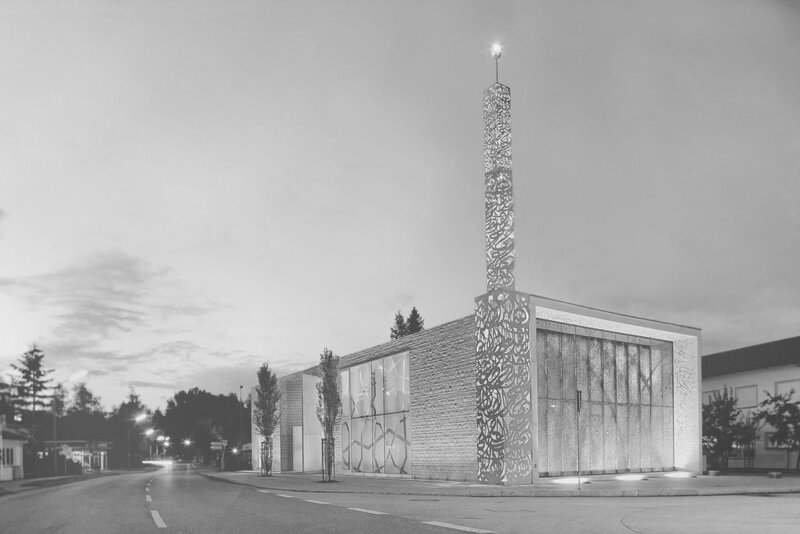 WEAST: For the award-winning Islamic Forum in Penzberg, you have included the prayers in minarets as filigree decorations of steel plates. So no prayers had to be called 5 times a day, but just 1 time in order not to disturb the neighbors. Nevertheless, the mosque radiates a modern yet poetic presence.Were there any other special features that you have devised for this construction, with particular reference to the environment? Certainly. The forum was my first work. The euphoria was great to realize such a building together with a very open-minded builder. 13 years have passed since the first stroke. Looking back, I am pleased that the house has had a positive effect on its surroundings as well as on its visitors and users. This has certainly contributed to the architecture. The openness of the community is reflected in the house - this is probably the main architectural contribution. WEAST: Is there a cultural heritage that you particularly value from the old homeland? Would it be possible to bring this into German everyday life? A.J: The self-evident approach of different religions and cultures in Sarajevo is something I would also like to see in Germany. This is somewhat paradoxical, since a terrible war had unfortunately changed this together for a short time. Despite the inhuman siege of the city, Sarajevo is still today a city with a vital variety. The large mosque is located in the neighborhood of the cathedral, the central Orthodox church and the synagogue. This is very enriching. WEAST: Does an extended view of cultures help you in your work as an architect? Of course! I also encourage my students to open up, to travel, to be curious, to try and dare. WEAST:. How do you find the identity of your opinion in a different culture without losing personal integrity? There is no guide or recipe for this. Everyone should decide for themselves individually. In the end, it is precisely the people with history who are interesting and inspiring - that could be a hint. WEASTS: Are there any outside areas of architecture, people or designers who inspire you? I find people who use intelligence, wit, and perseverance to change things that seemed unchangeable. WEAST: What is your key to success? Just recently, I saw an exhibition of a sculpture by Josef Wehrle that touched me. A lying cow struggling just effortlessly on the legs. Uneven, twisted with open mouth - not nice. But she has seen the power with which she gets into the booth. And so it is actually - without intensity it becomes nothing - only through painstaking work it can become something.